Three pupils from Lowton St Mary’s CE Primary School, located on Newton Road, have been chosen as the winners of Bellway’s art competition. With Pocket Green, a residential development offering a range of two, three and four bedroom new build homes just a short walk from the school, Bellway’s site manager Tony Charnock hosted a health and safety talk, at which he asked the children to draw a picture of a ‘safe’ building site. 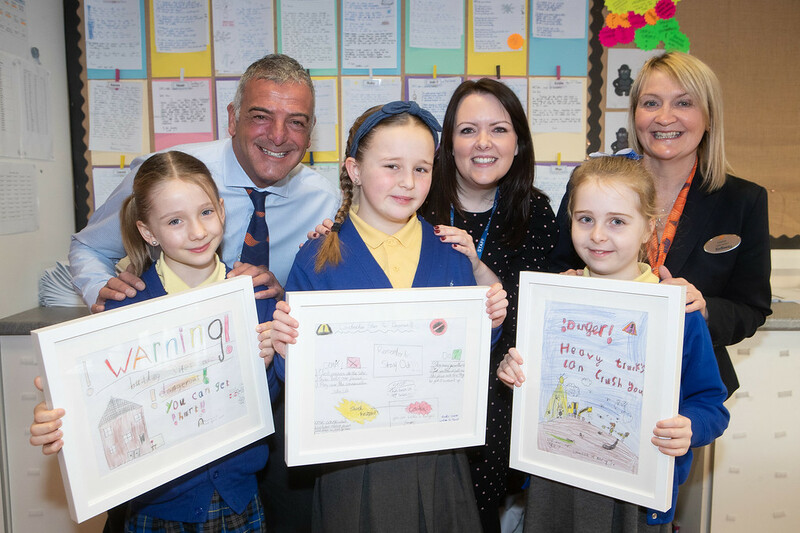 Lots of entries were received, all of which were excellent, and Tony, together with Bellway’s sales advisor Gaynor Robinson, found it difficult to pick just one winner, so Ella Charnley aged 8, Emelie Draper aged 10 and Maya-Cerise Bardsley aged 8 were all selected as joint winners. Ella, Emelie and Maya-Cerise each received a framed copy of their winning picture so it can be proudly displayed at home, plus gift vouchers to spend. Tony comments: “It was really tough judging the entries as the standard was so high. The pupils really enjoyed the health and safety talk I did at the school and the information we discussed was visible in their pictures, which was great to see. Located in the rural village of Lowton, just 30 minutes drive from Warrington town center, Pocket Green is a picturesque development of high-quality new build homes with plenty of open space and a pond. There is currently a selection of two, three and four bedroom homes available, with prices starting from £174,995. For further information, please call Bellway on 01942 665086 (open Monday and Friday from 10am until 5pm, Thursday from 10am until 7pm and weekends from 11am until 5pm) or visit www.bellway.co.uk.